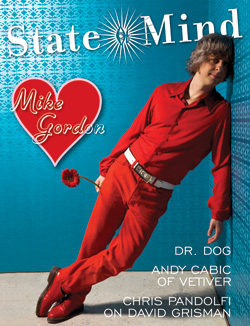 Yes‚ it's true: State of Mind hearts Mike Gordon. So we wanted to do a piece that did him justice‚ something that dug a little deeper. Over the course of several interviews and a lot of time watching (and listening to) Mike develop his new band and album‚ Mike McKinley had the chance to peek beneath the surface of Mike. The article is in-depth and from the heart‚ for an artist who's just the same. A year and a half ago‚ Dr. Dog crashed on the hardwood floors of writer Adam King's apartment after a gig. In 2008‚ with Letterman and Conan appearances‚ a Beck remix‚ glowing reviews‚ and a ridiculously good brand new album‚ they've come a long way. Adam caught back up with vocalist/guitarist Scott McMicken to talk about where Dr. Dog is now‚ and how life and their music have changed (and haven't) over the years. What's old is new. We can't stop spinning Vetiver's lovely new album of covers‚ Thing of the Past‚ here at the SoM Headquarters. Vetiver breathes fresh life into these great songs and Noah Gordon talks to Andy all about it. Josh Potter investigates the new shape of jazz and its intersection with jam and indie rock‚ with insights from Marco Benevento‚ Reed Mathis of Jacob Fred Jazz Odyssey‚ David King of The Bad Plus‚ Steven Bernstein‚ and label managers Andy Hurwitz of Ropeadope and Kevin Calabro of HYENA. WHEN IT'S REALLY HAPPENING‚ WHAT DO YOU SEE? During two weeks in June‚ Mike McKinley interviewed three compelling and unique artists from the jazz diaspora‚ violinist/vocalist Jenny Scheinman and guitarists Bill Frisell and Kurt Rosenwinkel‚ who have recently released new albums. A recurring theme took shape‚ what the artists see when they're lost in the moment of playing. All three had detailed and interesting answers‚ so we snipped and glued and pieced together this feature. For our "Musicians on Musicians" column‚ Chris Pandolfi‚ banjoist of the Infamous Stringdusters‚ shares his thoughts on David Grisman‚ how his music is eternal and why he's one of his biggest influences; Tom Hamilton of American Babies explains why the song "It Makes No Difference" is his six minutes and forty-six seconds of consistency; and Blue Turtle Seduction's guitarist/singer Jay Seals tells what songs they've been bumpin' on their tour bus lately.